Winner of two Pulitzer Prizes, Don Whitehead delivered battlefield dispatches that were classics of frontline reporting. One of the legendary reporters of World War II, Whitehead covered almost every important Allied invasion and campaign in Europe-from landings in Sicily, Salerno, and Anzio on the Italian front to Normandy, where he went ashore with the First Army Division. Writing for the Associated Press, he covered the brutal beachhead fighting and followed the Allied sweep to victory across France, Belgium, and Germany. 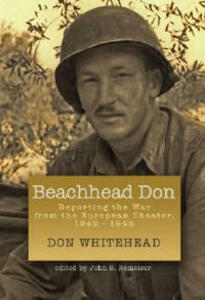 Daring, valiant, and fearless, "Beachhead Don" was one of sixteen correspondents awarded the Medal of Freedom by Harry S Truman. Collected here for the first time, his dispatches are classics of war journalism. This book, long overdue, will help a new generation discover Whitehead's vivid, powerful, and unforgettable stories of men at war. John Romeiser provides a richly detailed introduction and background to the man, his work, and his world.